Rapid Strength & Size Gains! 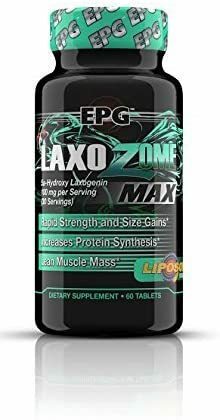 LAXOZOME MAX using Liposomal Technology combines a non hormonal ingredient with the revolutionary Liposomal Stealth Delivery, which increases the amount of absorption in the body to an unfounded amount of effectiveness, never before attained by any capsules, liquid droppers…or any other gimmicks. 5a-Hydroxy Laxogenin is a sapogenin isolated from the plant Smilax Sieboldi. As a spirostanic analogue of the - teasterone, Laxogenin is noted for its growth promoting ability in plants. Laxogenin was discovered in 1996 and shown to have an anabolic/androgenic ratio similar to the product Anavar (Oxandrolone is the chemical name of active ingredient in Anavar) without the harsh side effects; so at the proper dose, this compound is one of the only ingredients that can rapidly increase mass and strength gains without the hormone influence and that doesn't test positive. Laxogenin aids in controlling the stress hormone cortisol; high levels of cortisol are known to increase fat and muscle waste. Both male and female athletes claim to have seen strength increases in 3-5 days, and muscle mass increases in 3-4 weeks. Tests showed that protein synthesis increased by over 200%, the key to lean muscle growth and accelerated repair. In testing, 5a-Hydroxy Laxogenin has balanced cortisol response, which is the major cornerstone to healthy recovery and reduction of muscle wasting. It's also been shown to balance cortisol on calorie restricted diets, helps control glucose and increases thyroid function and it also has some profound anti- inflammatory effects. Liposomal Technology (created 50 years ago to help transport drugs effectively through the body) this phosphatidyl-liposomal coating provides a LIPSOMAL STEALTH DELIVERY that passes 99% of the 5a-hydroxy laxogenin through the destructive gastric system to be delivered to the blood stream undetected. Liposomal Stealth Delivery is the most advanced technology ever developed for getting poorly absorbed compounds into the body so they can work. Our body`s low absorption and bioavailability of a hydrophobic (fat-soluble) molecules, allows approximately 14% of the actual product ingested to actually enter the blood stream. With Liposomal technology the bioavailability is 99%. Compared to other Laxogenin products that are available... there really isn`t any other product out there that even comes close to 100mg servings - 30 servings per bottle… DELIVERED TO THE BLOOD STREAM THROUGH THE MOST EFFICIENT METHOD POSSIBLE.